Last week North Carolina posted its first billboard suggesting it is time for the state to change its marijuana laws. 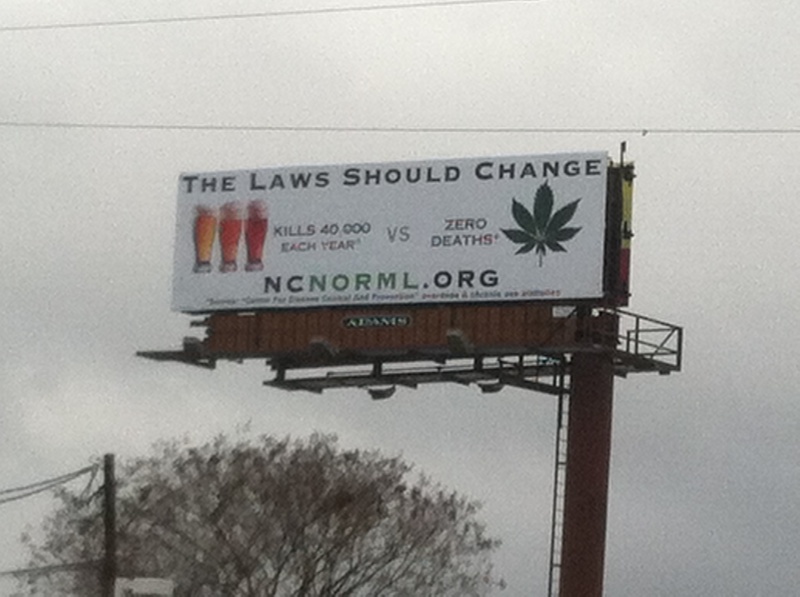 As part of NC NORML’s 2013 Strategy, donations were collected with an online social media tool to post North Carolina’s first pro-marijuana billboard. The idea is that part of NORML’s success in the state depends on the public understanding the relative health risks of marijuana. This billboard built on Marijuana Policy Project’s emphasis that marijuana is safer than alcohol. MPP collaborated with NORML’s state chapter to ensure an effective media strategy. The billboard bases its claims on scientific research. Specifically the Center for Disease Control data from 1999 to 2010 was reviewed to ensure the billboard statements were accurate. The CDC notes that on average 40,000 die every year from chronic use of alcohol and overdose, whereas cannabis is attributed to zero deaths in those same categories. This message is timely in that the US President, in a recent interview with the New Yorker acknowledged that he believed marijuana to be no more dangerous than alcohol. Additionally Patrick Kennedy, the lead spokesperson for the effort to maintain marijuana prohibition, also admitted on CNN that marijuana is safer than alcohol. In a statewide poll funded by NC NORML last month, it was found that 53% of those surveyed believed alcohol is more dangerous than marijuana and only 12% thought marijuana is more dangerous. This bodes well for the movement, but yet public education is key to ensuring voter perception is based on facts. NORML of North Carolina’s stance is that because marijuana is less addictive than alcohol and caffeine and is relatively non-toxic, the downside health risks associated with legalization and regulation are minimal compared to the damage caused by arresting 20,000 North Carolinians every year for possession of the plant. Many people with a wide range of diseases benefit greatly from the plant. It really is medicine and the state could potentially earn $180 million in tax revenue based on Colorado’s sales to date. The plan for 2014 is to continue the public education campaign by putting up more billboards across the state to help fuel the conversation. Because scientific research suggests the risks of marijuana use are minimal, and that much of the anti-marijuana propaganda offered by the government is being shown to be false, NC NORML intends to fuel the wave of re-legalization awareness washing over the country now. To post more billboards, NORML requires more donations – either from your volunteer efforts or cash donations. As marijuana support increases nationwide and across North Carolina, we see legalization as inevitable. How soon we can change the laws depends on how many of us contribute to the cause. If you don’t agree with the laws, we ask you to do your part to change them. Please consider joining NORML of North Carolina today. NOTE: The CDC does indeed attribute some deaths to cannabis, but they are all mentally ill patients who had cannabis in their system at the time. The data for each instance is labeled “unreliable”. We don’t know what that means in statistical terms, but the fact remains – no deaths to date due to chronic use or acute overdose. The plant has effectively been given a clean bill of health despite so much money spent trying to demonize it. Amen! I will live long enough to see this happen.